Recently, we watched a great documentary on Netflix called “Between The Folds.” The program was an exploration of all the ways where the ancient art of paper folding meet up with the modern world of science and mathematics. 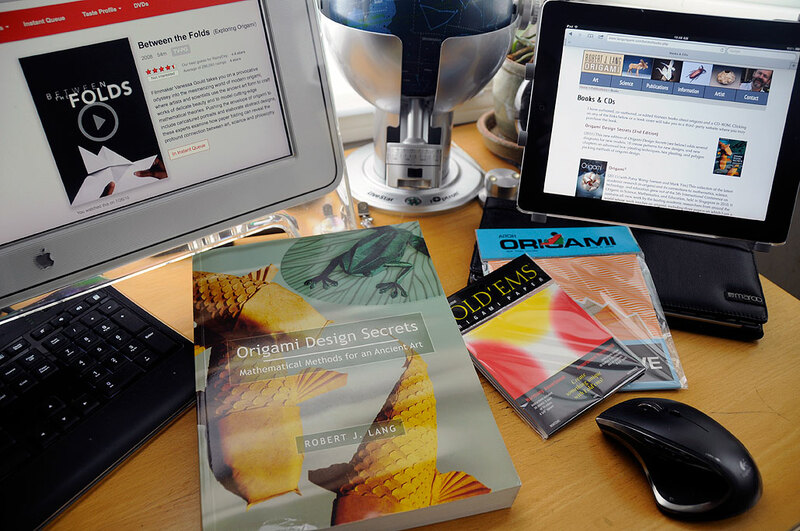 Watching the show brought to mind a book we have had on our shelf since 2004, but have not really taken the time to dive into, Origami Design Secrets by Robert Lang. Inspired by the movie, we decided to spend a day with the book and see what we could do. Origami (ori meaning folding, gami meaning paper) started in Japan around the 17th century. However, it may also have evolved independently in other parts of the world. Regardless of where and when the art originated, systematic study of it did not occur until the 1980s. In 2003, Robert Lang published the definitive work, Origami Design Secrets , on the techniques and the mathematics behind this ancient art. In order to describe how the folds are executed, Lang introduced a set of very precise terms, basic steps, and building blocks. With these fundamental units, he shows how very complexand intricate shapes can be created. While the final creation is a thing of wonder, the crease pattern is itself a thing of beauty. I wonder if there is anyone who can look at one of these patterns and make the folds in their head. Now that would be cool! Before we fry our brain with mind-folding, we probably should make a few simple folds with our hands (and some paper). The crane, flower, and fish are probably good ones to attempt. Hopefully, folding them will put us into the proper mindset for the more difficult efforts. A dozen or so folds later, we are starting to get the hang of making a sharp crease, reverse folding, and most important of all…unfolding. Some folds can’t be made over a previous fold, so you have to be willing to unfold it to make the next one. Yeah, that made no sense to us neither, until we went and did it. Even though our efforts were not precise enough to make a tiny crane which will fit inside a Christmas ornament, we felt confident enough from the results to attempt a more complicated fold. The hummingbird looked challenging, but not unreasonably difficult. We decided to give it a try. Some of the folds were definitely more challenging than those we had to make for the earlier projects. Lang’s directions were quite detailed, but even with the large number of diagrams and explanations, there were a couple of folds we just could not figure out how to make. Still, the final humming bird came out reasonably close to the picture. One thing we noticed while folding was a sense of relaxation even while focusing intensely. Not sure if it was because both the hands and the brain were engaged at the same time. It was an interesting sensation and something we look forward to feeling again soon.